Cold, rainy and snowy weather can mean less outdoor play, which can be challenging for little ones with lots of energy. 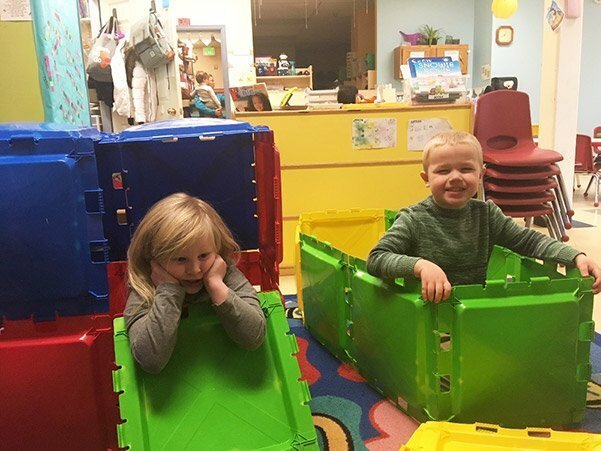 Here are some fun ways to make the most of your time indoors while keeping those little hands and feet warm! Indoor snowball fight – Prepare your battle stations using cotton balls, or white pom poms, for fun and safe play! Place a masking tape line down the middle of the room to separate teams. Set a timer for one minute and starting throwing and leave no trace on your side! The team that has fewer snowballs on their side of the tape wins! Obstacle course – create a wacky course using pillows, stuffed animals, foam blocks and hula hoops. Set timers and see how quickly little ones can accomplish tasks and cross the finish line. Then have them create a course for mom and dad to try! Dress up – Try on mom and dad’s clothes, shoes, or old Halloween costumes. Host a costume parade, or a fashion show, and be sure to catch it on video for grandma and grandpa! Museum and zookeeper – Create an indoor museum or zoo! Little ones can decide which toys and stuffed animals they would like to place in exhibits. Make homemade sign, posters and tickets for friends and siblings to enjoy!